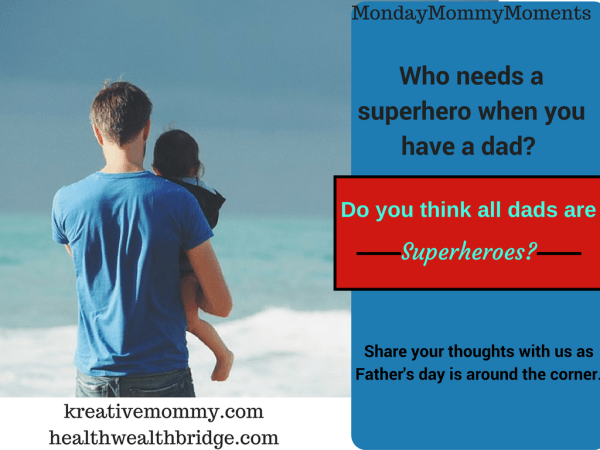 I came across this interesting prompt on Dr.Amrita and DeepaGandhi’s blog asking ‘Do you think all dads are superheroes?’ and it got me thinking, isn’t it true? All normal and sensible men are superheroes in their own right! Think back to your dad’s, don’t you hold a special place for them in your hearts? I do! For me, my dad gave me the best childhood that I could have asked for. So was he a superhero? Yes! When as a grown-up I realize the trials that my parents must have faced in my growing up years, they certainly are superheroes to me. Now coming to the other Dad in my life i.e My kiddo’s father. Is he a superhero? I bet he is! When I was expecting, I was a bit fazed with the changes that were happening within me and around me. I wondered if I would be able to manage the responsibility. Frankly, I was blissfully unaware of the all-nighters, feeding struggles, teething issues and the never ending list of challenges that will be thrown my way. It was the same for my husband. However, I realize now, that as I was fazed about the impending motherhood, he was about the impending fatherhood. But from day one, he assured me that we were in this together and he has supported me all along. A responsible father is born the day, a baby is born. The moment he holds the tiny baby, he realizes that now on everything will revolve around this bundle of joy. Be it his career choices, his hobbies or even his television watching habits, everything changes. A father undergoes many changes, just as a mother, but it is seldom talked about. If he is the sole breadwinner in the family, then his economics always revolve around his children and family. He might hate his job, but he won’t just leave it as that would put his family in distress. I have seen many fathers choosing their career paths based on the welfare of their children. Buying something for self will take a backseat and will happen only once all his children’s needs are fulfilled. They might travel far away from homes and live there for long spells, if it offers a good life to their family, all the while pining for dear ones. All this and more makes Dad’s special. Are they superheroes? I haven’t seen one, but I am sure if there was a superhero, he would closely resemble these many heroes that we encounter in our daily life. Wonderful Nehaji. I completely agree that a Father (and mother) is born the day a child is born. Loved the post truly!! Reminds me of my father and instills strength in me as a father!! This is so true, that a responsible father is born the day baby is born! Very well said Neha. If a father is the only bread earner, he will never stop working for the sake of his family. Thank you! It was a great prompt.